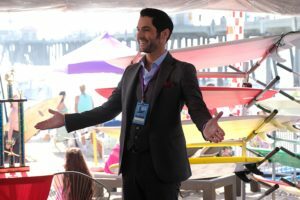 We are finally back with a new Lucifer after a three-week break and things between Lucifer and Detective Chloe Decker are not so great. Actually, Chloe is really upset with Lucifer for betraying her trust and he can’t figure out why she’s holding a grudge against him. In fact, Lucifer shows up at a crime scene without a call from Chloe and she promptly kicks him out. Of course, Lucifer doesn’t really know what to do with himself, particularly because he wants the detective to help him investigate Lieutenant Marcus Pierce (aka: Cain) and she’s point-blank refusing. Gee, I wonder why? 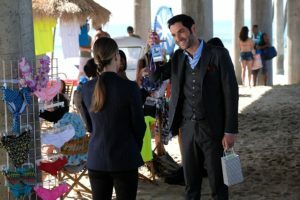 After a quick chat with Dr. Linda, Lucifer realizes he needs to make it all about Chloe so that she, in turn, will help him out. This plan ultimately fails even after it culminated in Lucifer reorganizing her desk and sorting her files into categories like boring cases, hot suspects, graffiti, and so on. His filing system did end up helping in the end, both with solving the case of the week (the murder of a surfer) and by bringing about the fight needed to get Lucifer and Chloe back to being Lucifer and Chloe. I think it helped when Lucifer emphasized that since that case was important to Chloe, it was important to him. How sweet! Cain You Give Me Some Answers? He’s the first known murderer after killing his brother (you know, Abel) and he seems to have been walking the earth ever since in various iterations and his current persona of Lt. Pierce is ready to move on from the LAPD to greener pastures elsewhere. Why does he want to leave? Because he wants to die. He’s tired of walking the earth in his own personal hell and is ready to go to sleep forever. 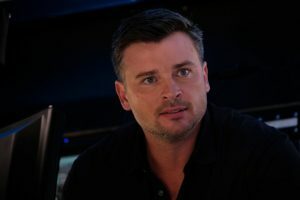 Cain admits to having Lucifer kidnapped and dumped in the desert, but that was just to see if Chloe has the same effect on him as she does on Lucifer. Apparently Chloe’s power to make Lucifer vulnerable only works on Lucifer. Despite Cain’s meticulous file keeping (yes, that was him) he’s out of options for now. After hearing all this, Lucifer decides to help Cain out and screw over his father in the process: Lucifer has realized that his dad returned his wings as a means to an end to interfere with Cain’s plans. If Lucifer can help find a way to kill Cain, Cain gets what he wants and it will upset his dad in the process. It’s a win for all except, maybe, Chloe and Ella who will surely miss the Lieutenant. Maze is so happy that Dr. Linda and Amenadiel aren’t boning that she gives Linda a knife that will slice through bone like butter. I’m sure she wanted to keep it for herself when she discovered they were seeing each other, after all. Amenadiel has a brief scare when a doctor diagnoses him with chlamydia. In the end, it was a false positive but he’s never been sick before and was starting to have some human symptoms. I wonder if he will forever lose his angel status and become a human after all. Ella was noticeably subdued after getting yelled at by the Lieutenant. Thankfully, Charlotte Richards told her to not let it affect her and to stand up for herself. After a false start of being tough with Lucifer, she confronts the Lieutenant and he apologizes. They hug and she seems to be back to her bubbly self.